Banten Province is situated in the west part of Java Island. Still, it belongs to Indonesia. It is popular for its beaches indeed. However, you can also find other natural attractions. 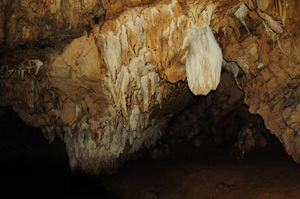 For example, there is Sangkir Cave in Lebak Regency. This recreational site is suitable for those who love an adventure and new explorations. The width of the cave is about 6 meters. However, no one knows how deep the cave is. Some experts even say it may reach Kanekes Village. Well, who knows? In terms of nuance, it is similar to any regular caves. The atmosphere is dark and moist. The walls of the cave are considered damp, as well. Somehow, it creates a creepy aura. If you want to explore the cave well, it is better to carry a flashlight. The floor is wet, as well. That means you need to wear proper footwear when exploring the cave. Another tip is the number of explorers. It is better to come with a companion. It is possible to explore the cave alone, but it is not recommended. The best thing to do is Sangkir Cave is definitely cave exploration. It is also called spelunking. In fact, it is a safe activity as long as you follow the procedures. If it is possible, you need to come with a professional. He can help you learn the art of caving. That means you won’t hurt yourself when exploring the site. You know where to go and how to explore the cave. Thanks to the expert. A local tour guide is also recommended. Before visiting Sangkir Cave, you must learn several rules of caving. The most important thing is your attitude. You must not take anything. What you can only take are pictures. Thus, it is allowed to carry a camera. Since the atmosphere is a little bit dark, you need to carry a flashlight. It helps you pass through obstacles easily. Also, you can use the flashlight to provide illumination for the objects before you capture some pictures of them. Thus, it is a prime item to carry when performing cave exploration. Next, it is related to the footprints. Don’t litter and you need to minimize any impact to the cave. If you come with kids, make sure they don’t draw anything on the wall. Any visitors should take care of the environment, after all. In some occasions, you may encounter bats. Have no worries. They cause no harm to you. On the other hand, you can make them your objects of photography. So, how can you reach Sangkir Cave? The location is in Lebak Regency. For those who come from Jakarta, it takes about 5 hours. The distance is 160 km, after all. When it comes to the transportation option, the best choice is a private car. It is fast and reliable. Also, you need to take Pantura Street for the fastest way to reach Sangkir Cave.